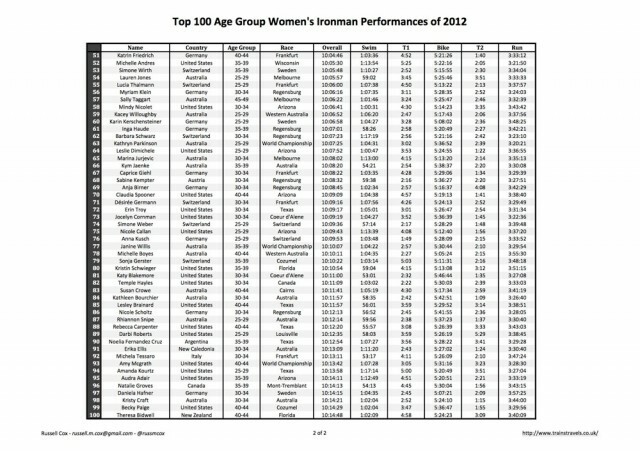 As usual results are simply ranked according to the time recorded at the finish line; I have made no adjustments for course or conditions in these tables and all full distance WTC Ironman events in 2012 are included. I have made every effort to ensure the validity of the results presented and remove erroneous timing data before compiling these tables. Clearly Ironman Sweden is either a good place to go for a fast time or attracts some very fast athletes (or more likely a bit of both). 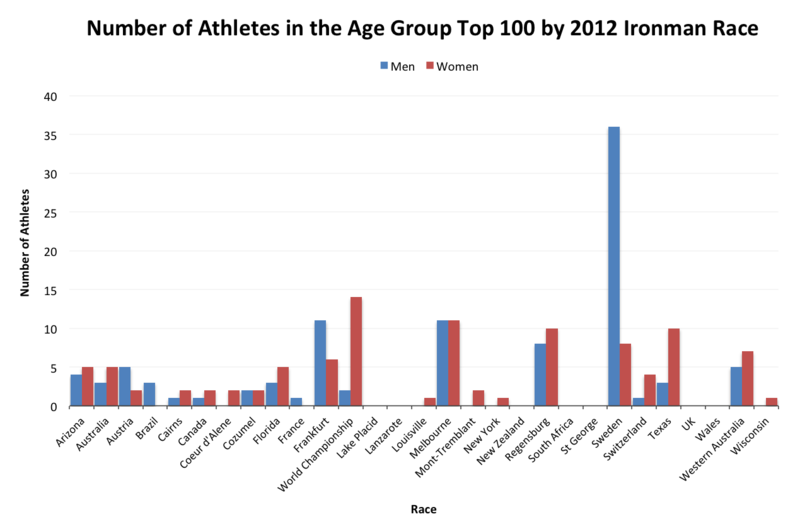 In fact a number of race names crop up regularly in these lists while others, like St George or Lanzarote, are notable for their absence. Some races are fast, others are slow; the more cynical might also comment that some are short and very occasionally some are long. 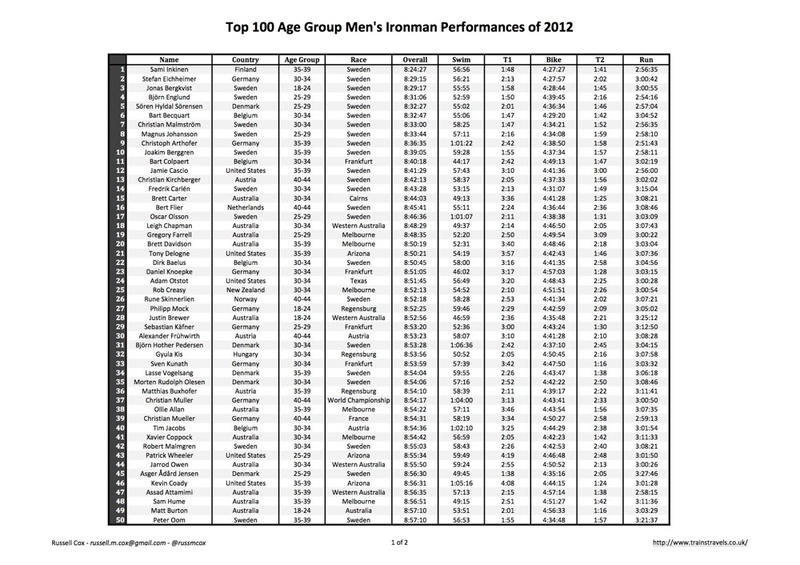 As the chart below shows for the men the fastest times are produced on four courses: Sweden, Frankfurt, Melbourne and the currently discontinued Regensburg. 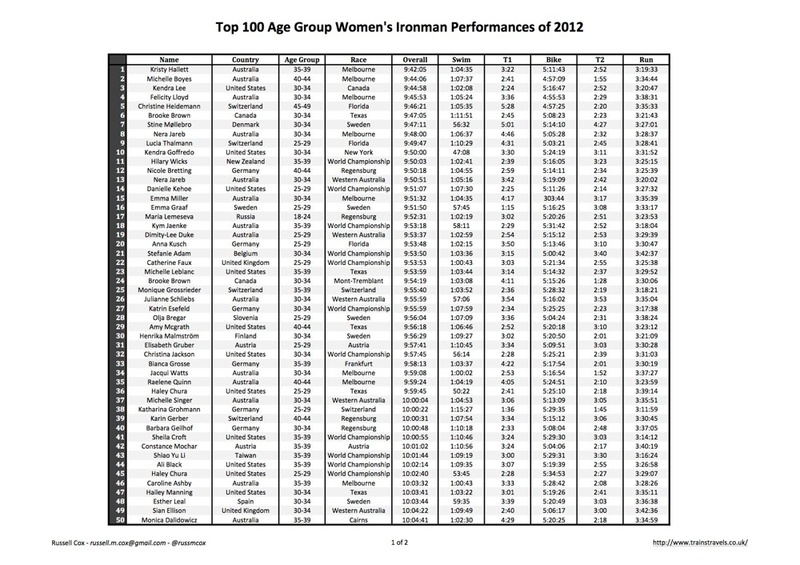 For the women the World Championship itself dominates, perhaps reflecting the lower numbers of women in this sport and consequently a shallower field at most races; Melbourne, Texas, Regensburg and Western Australia were also good choices. While it’s easy to control the races you enter, it’s another step to change the country you live in. 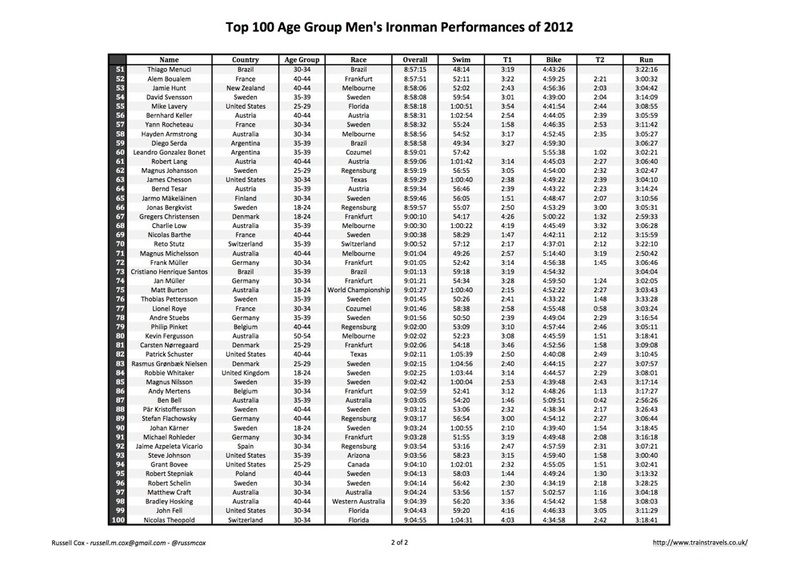 But as the graph below shows fast men tend to live in Australia, Sweden, Germany or the US. Not that I’m suggesting moving to one of these countries will make you faster. For the women it really comes down to the US or Australia as the place to live, with honourable mentions to Germany and Switzerland. 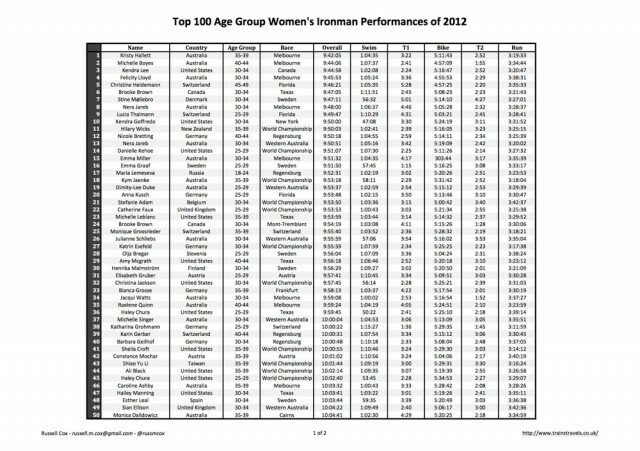 Unfortunately the UK struggles to produce top 100 age groupers. There is nothing you can do about your age and as the graph below shows if you’re looking to go fast you don’t want to leave it too late. 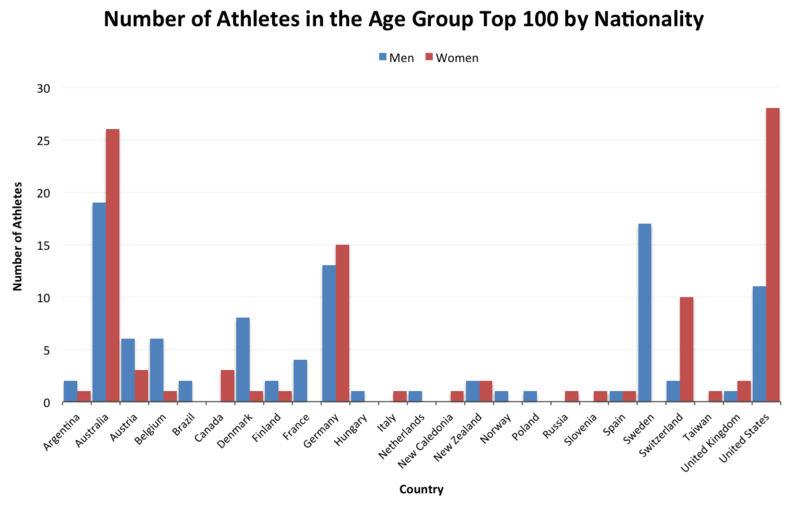 Here men and women aren’t too dissimilar – 30 to 34 is the prime age group for speed performances numbers tapering off to either side. Younger athletes note that there is still time. 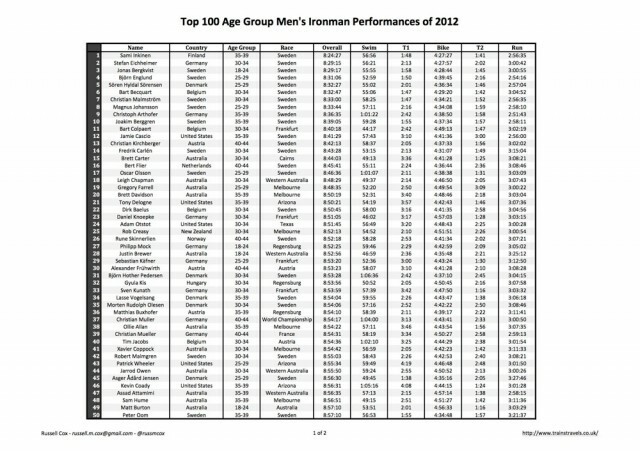 One final statistic: 81% of the top 100 men swam less than the hour. I just mention it for those athletes who want to race fast, but don’t want to swim. 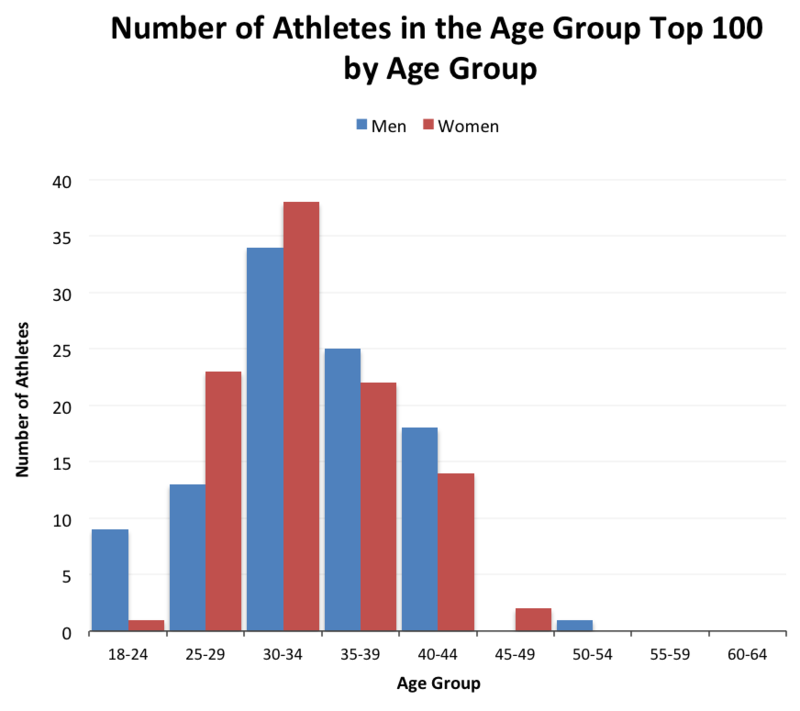 Swim training may offer poor returns for the age grouper in comparison with the other disciplines, but there is a point when you need to. Just saying. For now that’s an end to these league tables. Although it’s not the end of the Ironman data – I will be looking at ways of ranking Ironman races and perhaps producing race adjusted age group results among other things. 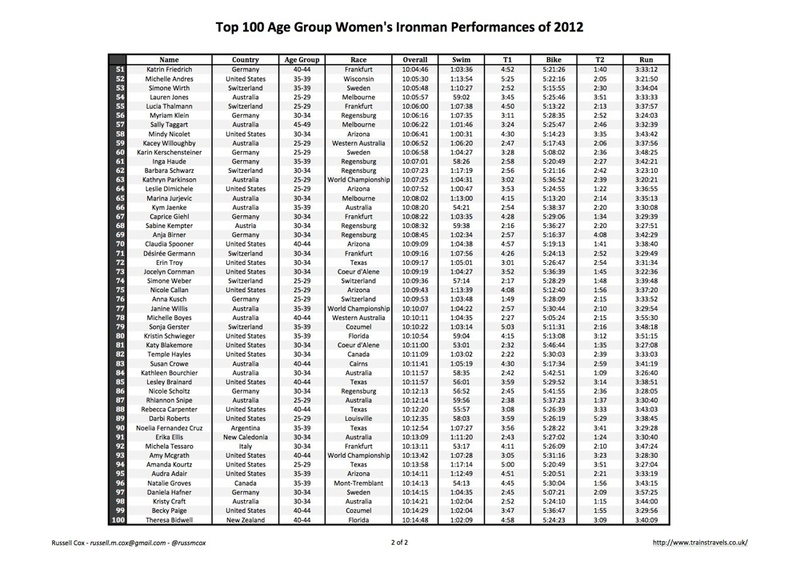 The 2013 season starts in March and I’ll be producing statistics for each race and updating 2013 rankings throughout the year.